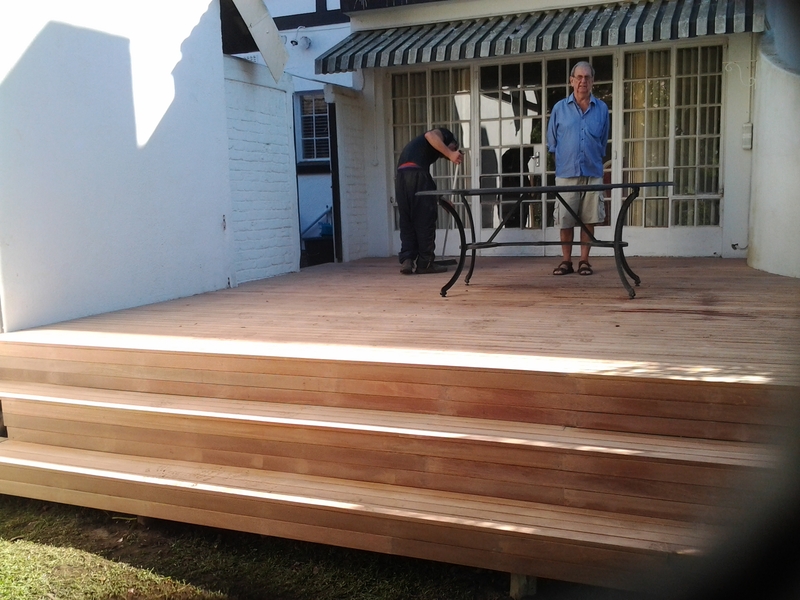 Here’s a wooden deck we at The Wood Joint built in Durban recently. 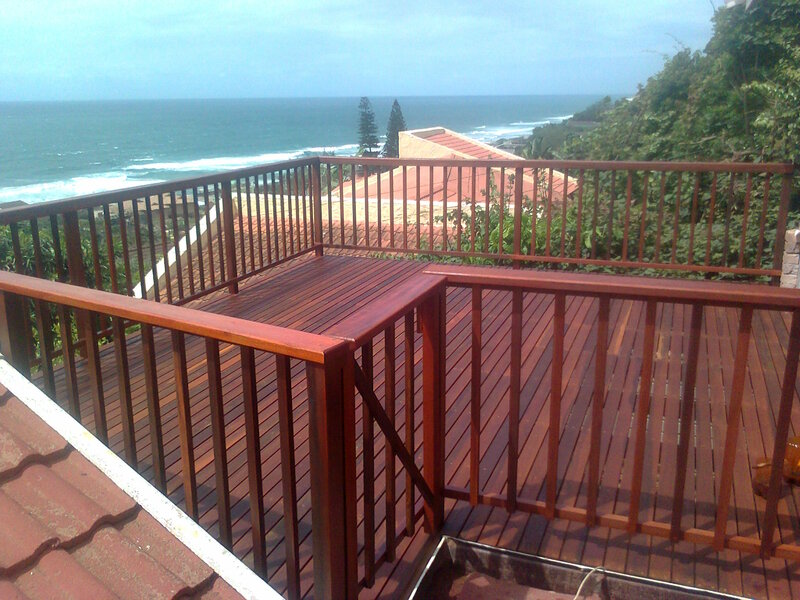 The Wood Joint is a wooden decking company situated in Durban and servicing most of KZN. It was a low-level wooden deck basically at ground level joining the pool to the patio and semi surrounds. The site was situated in la Lucia Durban. When building a wooden deck that will join a verandah to a pool, one needs to be careful to set the height of the pool correctly. The height to the verandah is of course pretty much set based on what the threshold of the sliding doors are. So working from a datum line of the top of the tiles of the verandah one would set the top of the concrete ring beam of the pool down 70mm from the required height of the deck. This will allow for a substructure of 50mm and a deck board thickness of 20mm (19mm in fact but to keep things simple rounded to 20mm). A 50mm batten fixed to the top of the concrete ring beam of the pool will give sufficient space to allow water to evaporate properly, keeping below the deck as dry as possible, and enough structure to create a positive fixing of deck board to bearer. The distance created between top of deck and pool should be minimal. It is not advisable to go much higher than 70mm because it creates a very big “climb” out the pool (from water level to top of deck). In this deck pictured you will see we ran the deck boards perpendicular to the verandah and pool side. Using this method it is not that important if the side of the pool is parallel to the verandah as the length of the deck boards can be varied quite easily without noticing any difference in length. On the other hand when the deck boards are run parallel to the pool side and verandah one needs to be careful to get the two as perfectly parallel as possible. Any difference will be visible because a deck board will need to be cut in a wedge shape to complete the space. If the difference is not that great then one can “fan” the deck boards to take up the difference in space by making one end’s gaps slightly bigger than the other end. So on one end a 6mm gap can be left and on the other a 4mm gap (normally 5mm throughout). This gains 1mm per deck board run. After 20 deck boards one can adjust for a 20mm difference in spacing. Another “trick” when running boards parallel to the pool side and verandah is to try to end on a full board rather than a half board. Again space between boards can be adjusted either up or down to try to end on a full board. It is much neater and won’t cause as many problems going forward. From the pics you’ll see we ended the deck on a half board which in this case was unavoidable because of the configuration of paving and deck. You’ll see from the pics that the garden is mostly left for landscaping until after the deck has been built. Trying to build a deck with newly laid grass and not damaging it is near impossible. Always get you building work done before landscaping. 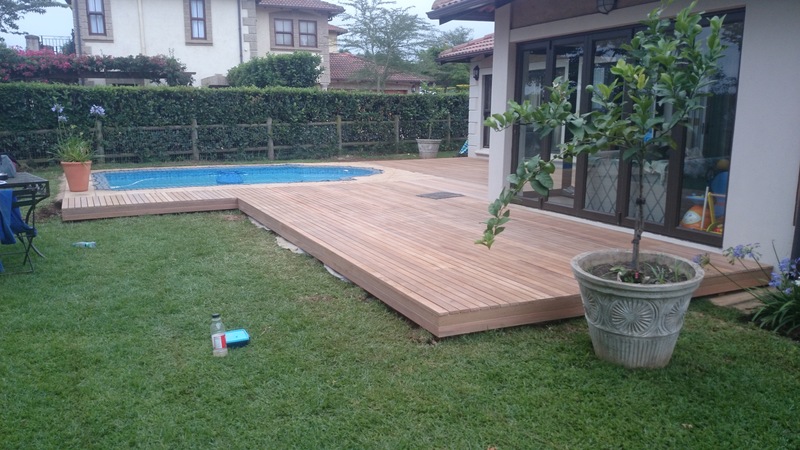 For a free no obligation quote on your decking requirements in Durban please call us on 031 – 762 1795 or use the contact us form below. 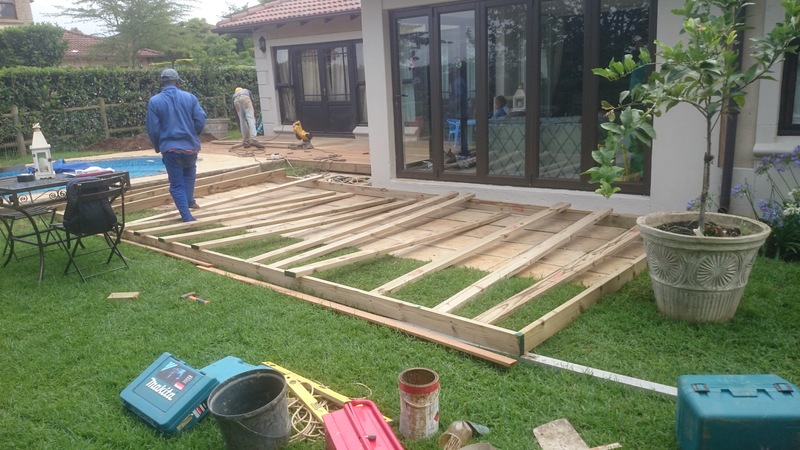 Although we are professional installers of timber decks in Durban, we also offer a DIY service whereby we will supply the materials required to build your own wooden deck. We will also provide a brief outline of what is required and how to go about installing it. As an introduction to this service I will offer some basic guidelines of how to set about building a wooden deck. The most cost-effective method is to use an H3 and H4 CCA Treated substructure and balau deck boards. H3 timber is guaranteed, by the supplier, for 50 years and H4 is guaranteed for 30 years. This is of course subject to certain conditions that need to be fulfilled such as sealing cut ends with an approved end sealer and using H3 and H4 where they should be used. You can see a list of H classifications on www.sawpa.co.za. Provided the correct H level of timber is used in the correct application your deck will probably out live you. Substructure construction will vary depending on the height of the deck and some other criteria, but basically you will be aiming to install joists at about 450mm to 500mm centres. This will vary depending on the total length you need to install joists over. The joists are generally built using 38 x 114 S5 H3 timber. S5 is minimum SABS structural grade timber and refers to the number of knots per square metre that are present in the wood. H3 is the level to which it is treated at the treatment plant. H3 is suitable for outdoors. If you are placing timber in the ground, or in constant contact with wet soil, it should be treated to a minimum of H4. Should you require main beams to support your joist structure you will typically use a 50 x 228 H4 beam and you can use 76 x 76 H4 treated square posts to support these beams. Your beams will be installed at 3m centres. If the structure is higher than about 2m I would suggest using gum poles to support it as they are harder and stronger. Again use H4 CCA Treated as they will be placed in the ground. It is best to use balau deck boards as they are a lot more stable than pine and will not bow and cup as easily as pine. I use the 19 x 68mm reeded deck board as they are relatively inexpensive in comparison to the 19 x 90 deck board. They need to be reeded and the grooved side must face down in order to allow water trapped between the bottom of the deck board and the joist to escape, thus preventing premature failure due to rot. One can also use other timbers such as Massaranduba and Garappa, but they are more expensive. Balau is fine for coastal regions. Garappa and Massaranduba work well in the Highveld where the temperatures range from very cold to very hot. Deck boards should be spaced with a 5mm gap between them in order to allow water on the surface of the deck to drain away quickly. For a free no obligation quote on timber supply or supply and install for your decking needs, please contact us on 031 – 762 1795, or use the contact us form below. Ponder and Dream of how ‘lekker’ it would be to have a good quality sundeck in our sunny climate, leading off your lounge, and onto your pool or into your garden… and yes, in South Africa a sundeck is as important as your lounge, or more so because of our outdoor lifestyle. Who to get to build it? The benefits of having it professionally installed versus a ‘fly by night builder’, or tackling this mammoth task yourself; the importance of the maintenance of your valued product and the importance of what wood type to use in its construction are all considerations to take into account when planning to invest in this forever “best thing I ever did” choice. Make it your Christmas gift to the whole family, all in one! • Balau (an imported hardwood from Indonesia, extremely dense, contains toxins that prevent termite damage and resins which repel water to prevent rot). The Wood Joint pays special attention to detail in all products and places great importance on durability and longevity in their products by applying sound techniques and slightly over engineering most products. They pride themselves in their quality workmanship and use only top quality timber sourced from reputable suppliers. A sundeck is a valuable addition to any home and will not only provide many years of enjoyment, but will also enhance the value of your property. With the correct care, maintenance costs can be kept to a minimum and the life span of your deck increased. The Wood Joint will assist you in a design that will be cost effective and will best suit your needs taking into account the existing structure that is in place. 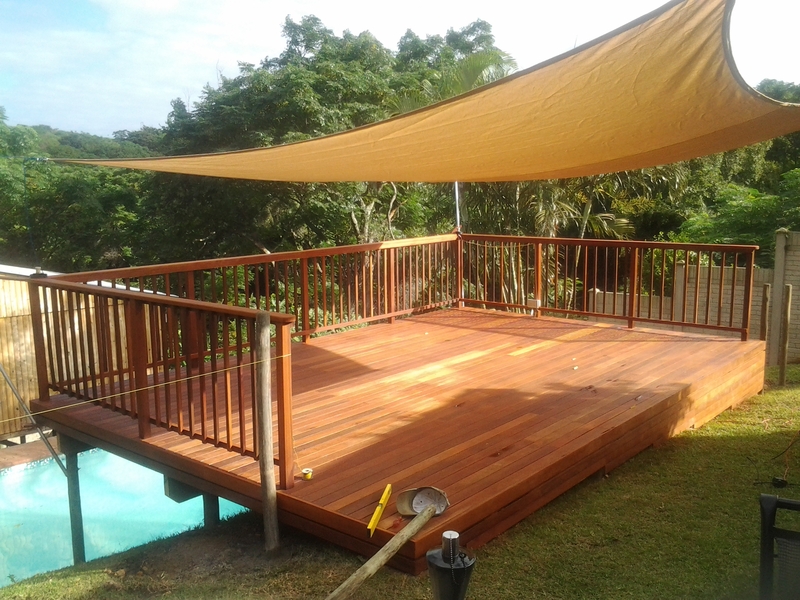 With years of experience in the deck building industry, The Wood Joint can advise, design, maintain and erect your deck in the most cost effective and structurally best methods. The most commonly used, and most cost effective timber, is Balau which is sourced from south East Asia. It is a yellow – brown to dark brown timber with a fine texture and interlocked grain and is extremely durable under tropical conditions. It is a fairly heavy timber weighing between 800 kgs and 1, 000 kgs per cubic metre when dry. It can be sealed or left unsealed. Unsealed it weathers to a grey colour. It can also be stained easily using a variety of tints to change the colour. Garapa is also a popular decking material as it is hard, heavy, tough and strong and is naturally resistant to rot, decay and insect attack. Found most commonly in Argentina, Brazil, Venezuela and Eastern Peru. It normally weighs between 800 kgs and 960 kgs per cubic metre when dry. A fine grained timber varying in colour from yellowish to yellow – brown / yellow – pink. It is, to a degree, scratch resistant reducing sanding during scheduled maintenance. Sourced form the West Indies and Central and South America, this timber is suitable for decks due to its hardness. It is extremely heavy weighing in at about 1, 050 kgs per cubic metre when dry. The texture is fine and uniform. The grain is usually straight but sometimes interlocked. The heartwood is light red to rose red. Keruing is naturally found in South East Asia. The timbers vary in colour from pinkish-brown to dark brown and look rather characterless. Grain is straight or shallowly interlocked and the texture is moderately coarse and even. All of the species contain oleo-resins and many of them will exude it onto surfaces during drying or when exposed to heat or sunshine when in use. The weight is variable too but is generally within the range 720 to 800 kg/m3 when dried. For free quotes and more information on The Wood Joint’s various wooden products contact us on 031 – 762 1795 or complete the form below. Timber balustrades are built in various designs and various different timbers can be used. The most affordable hardwood of course being balau with more expensive options being Massaranduba, keuring etc. The pieces required for balustrades are most commonly found in balau as they form part of the structural pieces stocked by most timber merchants. Massaranduba, keuring etc. are largely supplied in deckboards only and are used for the actual decking with balau being used as the substructure. All three of them are equally as durable and strong and only really differ in colour and grain. In this article we will discuss the picket style balustrade. This type of balustrade is often the only one that completely adheres to standard building regulations as the gap between any two pieces is, or can be made, less than 100mm. It should be designed with a cross horizontal support at the top and bottom to give the pickets a support to be attached to. The bottom horizontal support is normally set about 100mm from the ground and secured to each vertical post in as long a length as possible. The top horizontal support can either be set at the top of the post and directly beneath the capping or set 100mm down from the capping to provide a gap between it and the capping. The former being my personally preferred method as it then gives the capping a more rigid support and will reduce bowing and cupping of the cap. Each picket is then attached to these horizontal supports so that the gap between vertical pickets is equal. Care should be taken in setting the first and last one as the width of each picket needs to be taken into account when calculating the centre of each picket due to the first and last one being the vertical post itself. Pickets can be pre routed on the corners to give it a profile or left square. They can also be routed in situ resulting in the router not running all the way to the end of the picket. A capping is then placed and secured on top of the horizontal support and posts, or just to the posts if the latter method was used. This capping can then be routed over the edges to break the sharp corner. This capping should also be secured in as long a length as possible to avoid joins wherever possible. If a join is necessary it should be joined with a 45° join directly above a vertical post. This will reduce lifting on the joint.